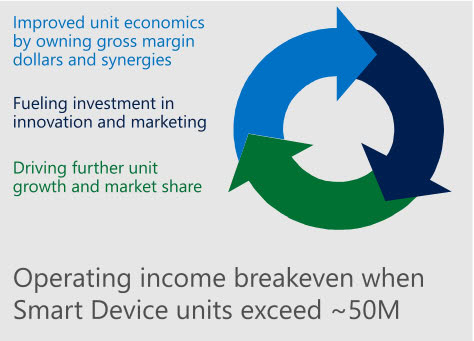 What remains of Nokia after the Microsoft Devices & Services acquisition? Microsoft's acquisition of Nokia came as a surprise to many who stayed up late yesterday or woke up this morning to read the news on their favorite tech blogs or news sites. It is hard to ignore, with nearly every website under the sun posting the exact same information about the deal. In short: Microsoft pays 3.79 billion Euro to purchase Nokia's Devices & Services businesses, and another 1.65 billion Euro to license Nokia patents. This includes the Lumia and Asha brands, and the right to use the Nokia brand on feature phones. The total of 5.44 billion Euro will be paid in cash by Microsoft, with the acquisition expected to close in the first quarter of 2014. The deal makes sense for Microsoft as it can now compete on an eye-to-eye level with Google - which acquired Motorola some time ago - and Apple, who is producing it own line of phones. Microsoft released a "strategic rationale" pdf document in which company executives explain the rationalities behind the acquisition. Benefits include a gross margin increase from less than $10 per unit in royalty to a smart device gross margin of over $40 per unit and the integration of hardware research & development and design. Because of the gross margin increase, Microsoft estimates that it has to sell more than 50 million phones for operating income breakeven. Microsoft plans to capture 15% of the worldwide smartphone shipments market share in 2018 expecting to generate an annual revenue of 45 billion US Dollars from that. What remains of Nokia after the acquisition? We have already established that Microsoft will take over the company's Devices & Services division. The two divisions that remain Nokia are HERE (formerly Location & Commerce) and Nokia Siemens Networks. HERE develops location-based products and services for a broad range of devices and operating systems, including our Lumia smartphones. As of January 1, 2013, HERE is the new name of our former Location & Commerce business and reportable segment. Nokia Siemens Networks, jointly owned by Nokia and Siemens and consolidated by Nokia, is a leading global provider of telecommunications infrastructure, with a focus on the mobile broadband market. HERE is best known for its HERE maps platform, the mapping service that is an integral part of Nokia smartphones. The company plans to continue development of the platform to become the "leading independent location cloud platform company" that is offering "mapping and location services across different screens and operating systems". Especially the operating systems bit is interesting, as it can very well mean that Nokia will make available HERE for other mobile operating systems. NSN will continue operations in the telecommunications infrastructure world. Commenting on the announcement, NSN CEO Rajeev Suri said that "Today marks an important step for our parent company Nokia, and they have our full support. For NSN, it is business as usual. We remain focused on executing our strategy, completing our restructuring and delivering industry-leading innovation to our customers every day." It is likely that Microsoft will use the Nokia brand name for Windows Phone feature phones for some time to come as the deal includes the rights to do so. Eventually though, the company will likely drop the Nokia brand name completely. You will be able to buy Nokia phones in the foreseeable future, maybe the next two or three years. Eventually though, those phones will become Microsoft Lumia and Microsoft Asha phones. Nokia's sole contribution after that period will be its HERE service in the consumer world, and NSN providing telecommunications infrastructure. As I never expect something good from MS hardware (it is way too overpriced and/or bearing Digital Restriction Management), Nokia is no-go for me after they went MS platform. Android is more open, less restricted, and it is a way better. I applaud the fact that Android is more open and less restricted. In what way is it better, though? I really wanted to like Android, but it’s just too slow and laggy. It shouldn’t take longer for a “smartphone” to launch/display my call history than it takes a 10 year old “dumbphone”. I really don’t care how open, how unrestricted and customizable the OS is if the most basic of functions expected from any dumbphone you can name (such as dialer, texting etc.) are slow to run. I’m no MS fan, but at least their phones work. And, as a matter of fact, you can get the low-end Lumias for much cheaper than you will get an Android phone with comparable specs (at least where I live). Comparable specs =/= comparable experience, though, and the Android phone in that price range will just run like an utter piece of crap. If you know what you’re doing you can make it run like a champ. But I know that not all people want to tinker with their phone and just want the damn thing to work and work fast. WP8 or Dumbphone fit right in that space I guess. I do know what I’m doing and I know from experience that there is no way to make low-end single-core Android 4.0.x phones (Xperia J or Tipo for instance) run as smooth as the low-end WP7.8 phones such as the Lumia 510, which, at one point, could be had for half the price of the Sony phone. Lumia 520’s out and, even though it’s much better spec-wise, it’s still cheaper than the Xperia J.
I’d like more apps, more openness and less restrictions, but, for me, 3x the price of my phone to reach the same level of smoothness and responsiveness is a wee bit excessive. I get that some people are willing to spend more to get a decent experience on an Android phone. I understand that some people are willing to put up with longer load times here and there (or maybe they just don’t notice/care) on their low-end Android phone. That’s all fine. What I don’t get is this: my 50-year old aunt goes to renew her contract with the operator and she wants to get a phone with a touchscreen. As you can imagine, she’s not exactly the kind of user who’s going to be switching launchers, tinkering with apps from the Play store, playing games etc. She likes the Lumia 610, but the store clerk explains to her that she should never get a WP phone because they’re terrible; so terrible in fact, that a 800MHz LG with Android 2.3.6 (priced similarly btw) would prove to be a much wiser option. Where does this stupidity come from? I’m all for everyone having their own opinion, but the amount of negativity towards the WP OS is beyond ridiculous. A lot of people know for a fact that the MS OS is worthless without even having tried it. So going back to the original post, no, the Android isn’t “better” than WP; it’s different, with its own strengths and weaknesses. Wait a second, you are not wrong, but do you realize that IF android was that limited like Windows phone it will still run that slow? I mean i had several android phones and at first all worked better , even faster than WP but after some app installs of course they started to work slower. But this is something i did, it was my choice. In the case of the phones I mentioned (and other budget Android phones with similar specs), they were noticeably slower than their WP competitors from the very beginning. App installs would only deteriorate the performance further. If you install software that runs in the background on WP phones then the whole system might start lagging too, sure. The thing is, MS made sure that phone manufacturers met their minimum spec to ensure that the OS functioned with appropriate speed _out of the box_. What the user does or doesn’t do with their phone later on is entirely beside the point. The user shouldn’t be expected to “know what he’s doing” (as someone suggested earlier in this thread) for the phone to function with acceptable fluidity and speed when it’s new and only its basic functions are being used. Not that there’s anything that can be done anyway. Note that all WP phones (across 7.x and 8.x separately) are very similarly specced. Android phones, on the other hand, are all over the place with their configurations. The low-end ones with single-core processors and low amounts of RAM run the same versions of Android the high-ends do and they run it like crap. The system they run wasn’t designed to work well with budget hardware and it’s painfully obvious to anyone who isn’t blind as soon as they unlock the phone and start swiping between screens/workspaces. Microsoft’s Trojan-Horse, Elop, has done his job well, resigned immediately as CEO of Nokia, and is back to Microsoft. I was thinking the same. I remember reading that this guy had left Microsoft and suddenly become the new CEO at Nokia. Then coincidentally Nokia surprised everyone and dropped development of their own phone OS and went with Windows Phone. Now suddenly the whole lot belongs to Microsoft, and he’s welcomed home. I agree with your point , It is obviously that the Trojan , Elop had finished his work and maybe depend on this , he can be the next CEO of MS .
Microsoft can take Lumia products to a good position….. I disagree. Look at Zune,Kin,Danger, Surface pro/rt…..
Who ever remained manufacturing Windows Phone (Samsung, HTC..) will drop them like hot potatoes. To be fair, support by third party manufacturers was not really that good to being with. Both Samsung and HTC seem to have concentrated most of their resources on the Android platform. There was a long story about MS mobile policy. Seller premium depends on device sales, those not returned back. MS devices cost more because of Windows (both Mobile and Phone) license fee, and had enough issues to make significant portion of customers return them (I heard a joke telling that American trying to get rid of Winphone device left it in car with car’s window open, but when he returned, there was one more Winphone laid next to his). That made Winphone sales difficult. More to it, the mobile platform success depends on applications. And did you hear about even one Winphone hit app Android or iOS don’t have? Me — not. So, Winphones weren’t attractive enough for customers, sellers and, because of that, to manufacturers. We’ll see if MS could make them more attractive. From my point of view both Winphone and Metro environments are “defective by design”: have bad platform foundations, and because of that hardly can compete with iOS and Android. Two analysts, Ben Thompson of Stratechary and Benedict Evans, assume that Microsoft had to buy Nokia because Nokia was going to stop making Windows Phones very soon. MS has been repeatedly shooting themselves in the foot in recent years and badly missed the boat in the wider, i.e. non desktop, OS market where the big money now is and will be for the foreseeable. Buying Nokia is an attempt to grimly hang on, but I can’t see it working. I don’t think MS has the inspirational capacity to reinvent itself. None of its many attempts in the mobile market has worked and now the latest incarnation is even negatively impacting the desktop OS. OK, my biggest attraction to Nokia was thier GPS-Hard-Glued devices (like my beloved 5800 XpressMusic), and I have been playing with some Lumia phones, I liked the simplicity (Android was too complex for a smart phone, not to mention for a phone, …. I am still talking about me!) and was realy planing on buying a Lumia, so, could anyone confirm or at least speculate if this GPS service will still be available? Windows Mobile 6: In 2007, Microsoft introduced Windows Mobile 6, formerly codenamed ‘Crossbow’. It comes in three different versions – ‘Windows Mobile 6 Standard’ for Smartphones (phones without touchscreens), ‘Windows Mobile 6 Professional’ for Pocket PCs with phone functionality, and ‘Windows Mobile 6 Classic’ for Pocket PCs without cellular radios. Windows Mobile 6 was based on Windows CE 5.0 (version 5.2). New features included VoIP (Voice over Internet Protocol) calling, improved Internet sharing, 320×320 and 800×480 (WVGA) screen resolution support and much more. The company came up with upgraded versions of this OS, with with various performance enhancements. Nokia, once the dominant power of the mobile phone industry, has ceded the smartphone initiative to Apple’s iPhone and Google’s Android, and Elop believes Nokia’s own Symbian and MeeGo operating systems aren’t competitive. Microsoft has tried for years to penetrate the mobile phone market, and although it now has a credible option with Windows Phone 7, it trails Android when it comes to developer interest and the breadth of phones available. Microsoft’s Elop, has done his job well, resigned immediately as CEO of Nokia, and is back to Microsoft.